A Cornish chiropractic practice is celebrating after gaining national recognition for its patient care and customer service. 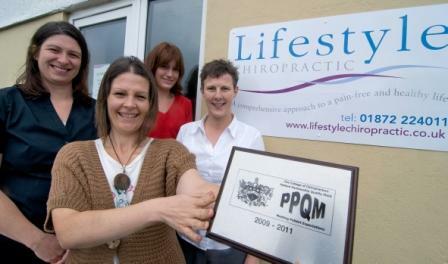 Lifestyle Chiropractic, which has clinics in Truro and Mawnan Smith, has been awarded the Patient Partnership Quality Mark (PPQM) by the College of Chiropractors. The award was presented to Lifestyle’s Doctors of Chiropractic, Amanda Hensman and Mairi Dowlen. “The whole team at Lifestyle are extremely pleased and honoured to have gained this award,” said Hensman, who founded the business in 2005. In order to achieve the PPQM mark, Hensman and her team had to demonstrate they met patient expectations across a number of key areas including accessibility, ease of booking and out-of-hours service, cleanliness and safety, privacy, communication and patient education.